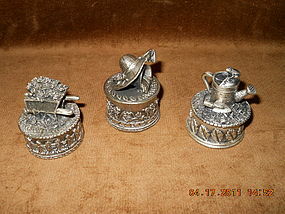 Set of 3 lady collectibles : each 2” high. Each is decorated in the spirit of gardening: one with water-can and frog; the second is a wheelbarrow filled with cut flowers; the third one is a straw hat decorated with flowers. Will be the perfect gift to a garden lover to hold earrings, rings or brooches. Excellent condition.